Swag curtains or swag drapes are more than often look at and admired but never are they considered as an item that can be made or sewn by the average sewer. Think again follow my simple formula and I will show you how to make beautiful swags in an easy and effortless way. I have been decorating homes throughout the world using this unique modern swag. Many swag curtain manufacturers try and complicate the process of making swags, they try to discourage people from attempting to sew these beautiful design curtains because it basically is a protected product and to be honest most people wont want to attempt them because of the perceived difficulty of getting them looking nice and professional. 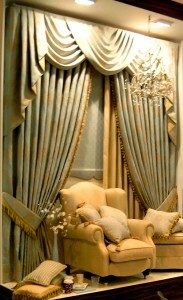 Follow the following steps to creating your own swag curtain or swag drapes. 1. One of most important facets of any window covering or curtain idea is to firstly measure your window, remember measure the width first and then the drop or height of the window. For example you may end up with a measurement something like 2000mm wide x 2100mm drop. 2. Now go to your local hardware store and purchase a piece of pine 19mm thick, if you are installing your swag curtains or swag over existing curtains you need to allow and extra 100mm on the width of your window and the projection of the timber should be at least 190mm. So if we are using the example measurement above , we will purchase a piece of timber 2100mm wide , depth 190mm thickness 19mm. 5. Now here comes the fun part, for your new swag curtains go to your local fabric shop and purchase enough material based on the following formula, if your window is 2000mm wide purchase 3metres of material. You basically need an extra metre of material dependant on the width that your new swags will be. 6. Now most material that you purchase will either be 1200mm wide or 1400mm wide, we are now going to turn the material sideways so that we can run it along the top of the headboard where we have stapled the Velcro. For example if your swag curtain is going to be 2100mm wide allow 40cm extra dependant on your individual swag headboard size. So on our example we will cut our material to 2500mm wide. So if we turn our material sideways we end up a piece that is 2500mm by the width of the material that is either 1200mm or 1400mm. 7. Once we have the material turned sideways we now sew the other side of the Velcro tape, often referred to as the loop tape onto the back of the curtain material, allow the tape to sit 20mm below the top of material. The swag material is now ready to be attached to the headboard. 9. Now with the extra material that you have left over you need to sew and make 5 bands of materialapproximately 50cm in length and 5cm wide, these are what we call our swag tabs, now starting from the middle of the headboard staple one end of swag tab under the headboard, bring the other end of the swag out to the front of the material and staple it to the top of the headboard, guess you are now forming your swags on your new modern swag curtains, no go to each end of the headboard approximately 100mm in from each end and repeat the procedure. The remaining 2 swag tabs are used around each corner and set in around 50mm. 10. You have successfully created your new modern swag curtain by following how to make swag curtains in 10 easy steps… Install you swag approximately 100mm – 150mm above your window.